The Kershaw 7Ðin. Fillet is perfect for filleting medium-to-larger fish with ease. The blade is made of Japanese 420J2 stainless steel with just the right degree of flex to make the job of filleting simple. This softer steel enables the blade to bend without breaking so that it moves easily through the body of the fish to give you the ideal fillet. The Kershaw 7Ðin. Fillet is perfect for filleting medium-to-larger fish with ease. The blade is made of Japanese 420J2 stainless steel with just the right degree of flex to make the job of filleting simple. This softer steel enables the blade to bend without breaking so that it moves easily through the body of the fish to give you the ideal fillet. Plus, the steel is highly corrosion resistant-always important when you&apos;re working around water. 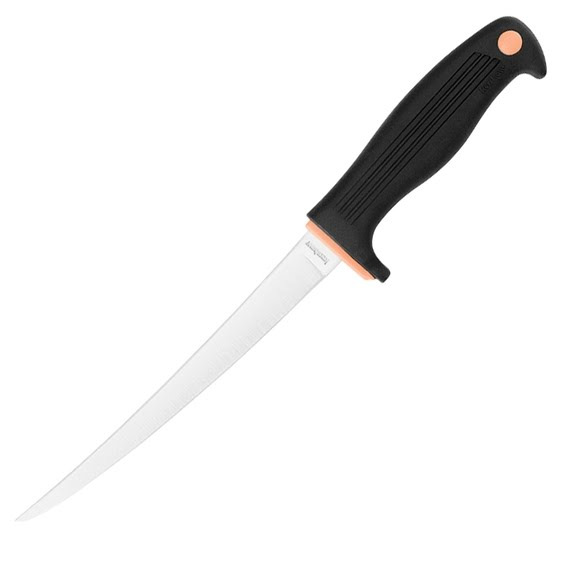 The handle is durable and contoured for filleting comfort. Neon highlights in the handle make it easy to spot in a marine environment-while still looking good with a basic black handle. The co-polymer handle material provides an excellent grip and its soft-yet-firm texture makes the job of filleting even a large catch less fatiguing. The design of the handle, with its central contour and hand protectors at both ends fit the hand and helps it lock in for an extra-comfortable grip.